Erik Solheim, the former Norwegian government minister and leader of the Socialist Left party (SV), has admitted to making mistakes in how he tried to save the climate while traveling business class. Newspaper Aftenposten reported late Tuesday afternoon that the head of the UN Environment Programme (UNEP) has now decided to resign, after spending around half-a-million US dollars on travel during his first 22 months on the job. Solheim confirmed to newspaper Dagens Næringsliv (DN) that he had agreed with the UN secretary general to resign as chief of UNEP. Aftenposten had first reported his pending resignation based on several anonymous sources described as well-informed. Aftenposten’s report came two months after Solheim first faced a severe scolding from UN auditors who criticized not only his spending on massive international travel but also an alleged lack of respect for UN regulations and funds. His commitment to the environment and efforts to reversing climate change was also questioned because of all his extensive flying around the globe. “Solheim’s departure has been a big topic of conversation at the UNEP headquarters in Nairobi on Tuesday,” Aftenposten was told. It was initially unclear, however, whether Solheim was leaving because of more criticism in a final UN audit of Solheim’s expense accounts. He indicated it was, while also defending himself. It was the UN’s preliminary audit that caused so much trouble for Solheim when it revealed both his constant and excessive travel and his chronic absence from the office in Nairobi. He readily accepted the criticism and was given a chance to respond to it in detail. “It’s also emerged in both UN and Norwegian foreign ministry circles that US officials have had problems with Solheim’s leadership,” Aftenposten reported. 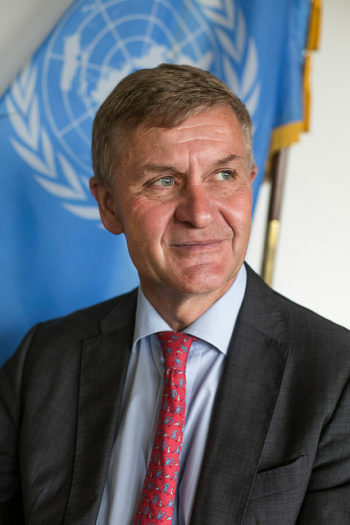 Solheim, who took over as UNEP boss in 2016, has already admitted to violating various expense reporting rules, and he personally paid back the equivalent of NOK 50,000 (around USD 6,000). He wasn’t willing to take all the blame, however, pointing to a heavily bureaucratic system at the UN and a lack of better control mechanisms. His credibility as the UN’s top climate advocate has been at stake. Solheim also has had years of experience in politics, government service and at the UN itself, where he was heavily involved in trying to broker peace in Sri Lanka. He served as a top official at the OECD in Paris from 2013 to 2016, after serving as a minister in the left-center government headed by former Labour Party leader Jens Stoltenberg, who now serves as secretary general of NATO. Solheim was in charge of both foreign aid and environmental issues during his eight years as a government minister in Norway. His expensive and excessive traveling as UNEP chief drew protests, with both Sweden and Denmark deciding to withhold funding. That was viewed as an unusual move and a signal that UN officials also need to think about taxpayers’ money that ultimately finances their work. Solheim defended his travel on the grounds it was important to meet leaders around the world and make the UNEP more visible.